It took me a little longer to do my morning routine, devotions, getting dressed, picking blueberries, and enjoying blueberries and peaches on my cereal. Yum! On Wednesday I wore one of my favorite pink floral shirts, and I don't really remember where I got it. I think it may have been Walmart or Burke's - not sure! 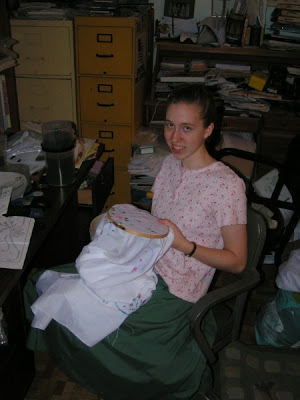 =) I wore a skirt I made for a girl in the Ruth musical who then didn't end up being in it. She was a younger and shorter girl (I'd made it ankle-length for her) but it ended up fitting me just fine and being a nice cool skirt for summer. I like how full and light it is! I also Frenchbraided my hair, keeping it off my neck and out of my face for the day. In the morning, I spent quite a bit of time online, catching up on others' blogs and posting on this one. Reading the Rebelution, I saw that they'd posted a link to their father's sermon at Bethlehem Bible Church. Knowing that if I tried to listen and browse the web at the same time I wouldn't be listening fully, I instead got my cross stitch project and enjoyed embroidering while I listened. The message was really good! But that's no surprise - I enjoy pretty much anything that one of the Harrises put out. =) It was beautiful how Mr. Gregg Harris praised his wife, his Proverbs 31 Woamn. I thought it very true when he said that the work of young people in the home is our training ground for our future. We should work hard and labor diligently! I have been blessed to be able to walk with my wise parents - I'm so thankful for them including me in their life. Though the message was mostly aimed at parents, I enjoyed getting ideas and tips for the day when I may be a parent. Then there were other little things and reading in my various books as well as doing Memlock. After lunch I set to work cleaning the living room and entry way. I was having a fun and energetic time until I went outside to shake the rugs. While shaking one, I accidentally stepped on a yellow jacket that I didn't see, which hurt really bad! You should have seen the look on Jubilee's face when she saw me bounce in the door, down the stairs, and to the freezer for ice, all on one leg! =) I quickly explained what had happened, which made her loose her bewilderment and start laughing, saying, "It's a strange sight to see Anna bouncing through the kitchen!" When my foot was numb from the ice, I went back outside to finish shaking rugs then swept inside. My foot continued to hurt through the afternoon, but the pain gradually went away. I did various little to-dos, then sewed for a while, completing the bodice of the third bridesmaid's dress. I took time to plan the music and moves for teaching the next day, then set to work on the sleeves of the dress. As I was ironing them (we have the ironing board in the living room) my sister Miriam walked in - at 4:20 p.m. My face showed shock when she told me she had quit work - her joke worked! Rather, she had come home early because the power went out at her office. She had some costumes to sew for the drama team she's on, so she started those while I attempted to change the thread on my serger to the wooly nylon thread to make rolled hems. It's hard to fit that kind of thread through the little holes in the needles! I only got one through after quite a lot of trying, and went to complete supper. I'd already put the potatoes on to boil, so I set about making the rest of Shepherd's Pie. As soon as I slid it into the oven, piled with the fluffy mashed potatoes, I quickly washed the mixing bowl, dried it, and made Corn Bread Muffins. As they cooked, I made salad, then again, unsuccessfully tried to thread my serger. Everything turned out well for supper (trust me, it doesn't always!) which was good, for Mom and Dad were bringing half of it with them to Bible study. After enjoying the yummy food, Miriam, Jubilee, Rachael (Jubi's friend who was over for the day) and I played two games of Dutch Blitz. It was so much fun! I won the first game, then Miriam won the second, though Jubilee was close behind! After Dutch Blitz, I succesfully threaded my serger (yes!) after Miriam reminded me to tie are regular piece of thread to the wooly nylon thread, then thread with the regular thread, pulling the wooly thread through. It worked wonderfully the first time - why didn't I think of it earlier? ;-) It took a while to figure out the right settings for the rolled hem, but eventually I found the right balance of thread tension and cutting width, and serged the neck of a costume Miriam had made and the sheer overlay of the two flower girl's dresses. The rolled hems look great! 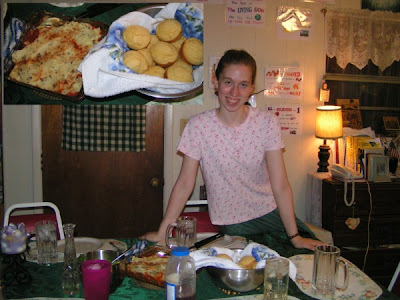 It's was around 9:15 p.m. but I hadn't had time to practice piano during the day, so I did that, talked some with the family, then got ready for bed, reading some in World Magazine, and turning out the light at 10:13 p.m.
My sister Anna and I are both followers of Jesus Christ, commonly called Christians. "A true Christian is someone who has repented of his or her sin and put faith and trust in Jesus Christ alone. Their trust is not in following a religion or a set of moral codes, or a list of do’s and don’ts. A true Christian is a person who has put his or her faith and trust in the person of Jesus Christ and fact that He died on the cross as payment for sins and rose again on the third day to obtain victory over death and to give eternal life to all who believe in Him. John 1:12 tells us: “But as many as received Him, to them He gave the right to become children of God, to those who believe in His name.” A true Christian is indeed a child of God, a part of God’s true family, and one who has been given new life in Christ. The mark of a true Christian is love for others and obedience to God’s Word (1 John 2:4; 1 John 2:10)." However, I'm not sure whether or not that's what you were meaning - I hope that through my writing people can tell that I'm a Christian, following after Jesus. Some people, I know, refer to one's denomination as one's "religion", though we don't usually refer to it that way. :-) If that's what you were meaning, we've gone to a variety of denominational and non-denominational churches, currently attending a Christian and Missionary Alliance and an Anglican one. Yes, it's weird to go to two... but one meets in the morning and one in the afternoon, and my parents have chosen to go to both at this point. Maria Pauline: My ideal cleaning routine (which doesn't always happen!) 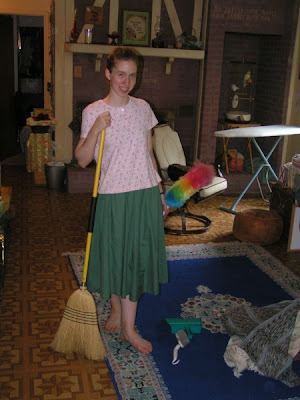 is to clean one or two rooms per day. That way, the house is in a general state of order, and I don't have to spend too much time each day to get it that way. I clean more in-depth some days, just lightly other days - it depends on how the room looks, and how much time I have!